Robert L. Wears (MD; MS, computer science; PhD, industrial safety) is Professor of Emergency Medicine at the University of Florida Health Science Center - Jacksonville, and Visiting Professor in the Clinical Safety Research Group, Imperial College London. He is a practicing emergency physician and has since 1994 been studying safety in healthcare settings. His specific areas of interest include resilience in small work teams, response to the unexpected, the design of artefacts to support distributed cognition, and the impact of computerized information technology on safety and performance. 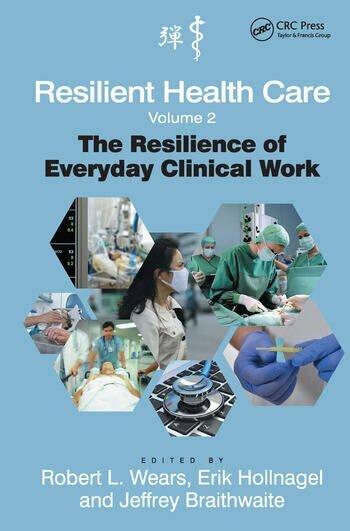 He has authored over 250 papers, book chapters, and essays, the most recent title being Patient Safety: A Brief but Spirited History (in Zipperer, Patient Safety: Perspectives on Evidence, Information and Knowledge Transfer; Gower, 2014). He is Senior Associate Editor of Annals of Emergency Medicine, and serves on the Editorial Boards of Human Factors and the Journal of Patient Safety. He is also a member of the Board of Directors of the Emergency Medicine Patient Safety Foundation. Erik Hollnagel (PhD, psychology) is Professor at the University of Southern Denmark, Chief Consultant at the Centre for Quality Improvement, Region of Southern Denmark, and Professor Emeritus at University of LinkÃ¶ping (Sweden). He has since 1971 worked at universities, research centres, and industries in several countries, most recently as Industrial Safety Chair at MINES ParisTech (France). He has worked with problems from many domains including nuclear power generation, off-shore, aerospace and aviation, air traffic management, software engineering, healthcare, and land-based traffic. His professional interests include industrial safety, resilience engineering, accident investigation, cognitive systems engineering and cognitive ergonomics. He has published more than 250 papers and authored or edited 20 books, some of the most recent titles being The Functional Resonance Analysis Method (Ashgate, 2012), Governance and control of financial systems (Ashgate, 2011), Resilience Engineering in practice (Ashgate, 2011), The ETTO Principle (Ashgate, 2009). Erik is also Editor-in-chief of Ashgate Studies in Resilience Engineering. Jeffrey Braithwaite, BA, DLR, MIR (Hons), MBA, PhD, FACHSM, FAIM, FFPHRCP (UK) is Professor of Health Systems Research and Foundation Director of the Australian Institute of Health Innovation at Macquarie University, Sydney, Australia. He is Visiting Professor at University of Birmingham, UK, Adjunct Professor of Resilient Health Care and Patient Safety, University of Southern Denmark, and Senior International Fellow at the Canon Institute for Global Studies in Tokyo, Japan. His work investigates and contributes to systems improvement. His expertise is in empiricising and theorising about health systems including researching the culture and structure of acute settings, leadership, management and change in health sector organisations, quality and safety in health care, accreditation and surveying processes in international context and the restructuring of health services. Professor Braithwaite has published more than 300 refereed contributions, and 500 total publications and he has presented at or chaired international and national conferences, workshops, symposia and meetings on more than 500 occasions, including over 60 keynote addresses. Professor Braithwaite is the recipient as at 2014 of career research funding of US$60 million spread over 60 grants. He referees for 30 journals and the health research bodies including in Ireland, New Zealand, Switzerland and the United Kingdom.